April is Earth Month, a wonderful time to reflect on how we’re impacting our planet and maybe explore a new, greener habit. Zero waste shopping is one way to greatly minimize your impact, and there are so many options to get started! Here at the Co-op, we’re researching the best zero waste shopping strategies and recipes so we can share them with you on April 20 during our Shop, Learn & Save the Planet event. Below you’ll find just a few of the tips we’ll be sharing. Before anyone can meaningfully change any habit, they usually need some solid reason(s) to motivate them to push outside their comfort zone. 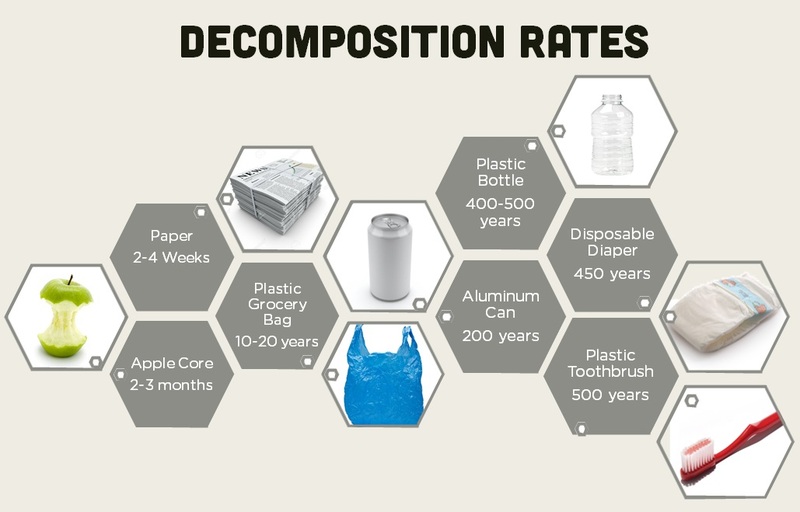 Simply put, zero waste is about modifying your life to minimize the use of anything considered to be “single use”. 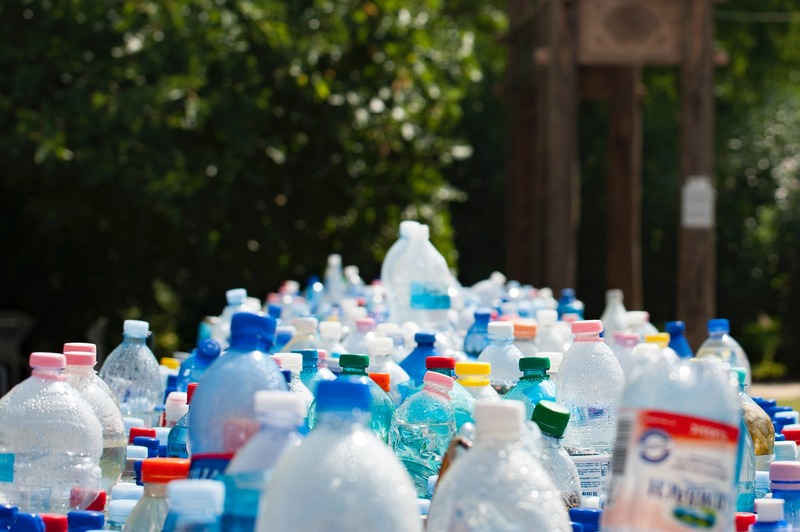 This includes things like plastic bags, drink containers, food storage bags, styrofoam containers, plastic wrap, diapers, plastic utensils… the list goes on and on. The problem with many of these materials is they have to go somewhere when we’re done with them (a lot of it ends up in our oceans), and these bits of garbage that we throw away without another care will be around a lot longer than we will. Hundreds of years longer, in many cases. Not only that, we harm the environment quite a bit with shipping these materials across our country and across the world (think of all the shipping costs you’re on that huge jug of laundry detergent). If we simply reevaluated what we consume, we can find myriad ways to reduce our environmental impact. 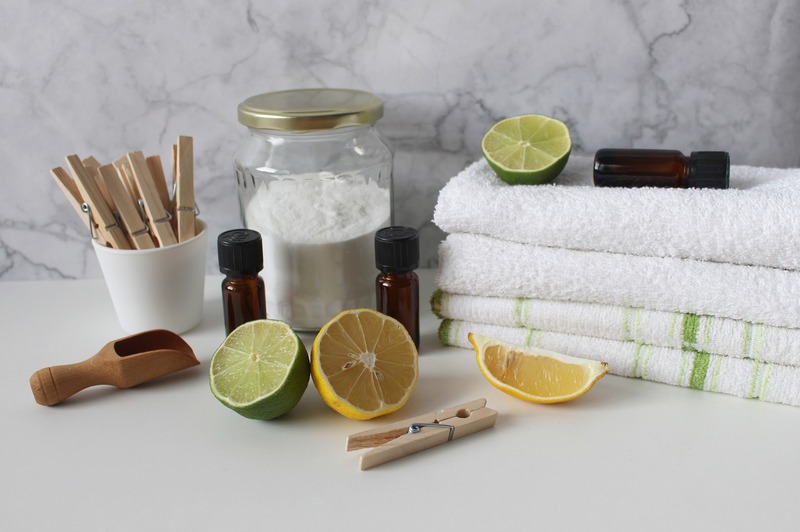 Since many cleaning supplies contain water as the first or one of the main ingredients, an easy switch to powdered or DIY formulas where you add your own water is an easy zero waste switch. When you go DIY or buy your detergents in bulk using your own packaging, your efforts go even further for Mother Nature. Mix soap and water, warm using a pot over low heat or by heating for 30-second increments in the microwave until the soap has melted. Add in the washing soda. Let sit 8 hours, or overnight. The washing soda in this recipe helps to thicken the dish soap, if you would like a thicker consistency, use ½ t. of washing soda. Grate the bar of soap. In the food processor, mix all ingredients. Pulse a few times, until the soap is very fine. Use 2-3 T. per load of laundry. Warning: Do this in a well-ventilated space, as this makes a fine powder! Not into the DIY or just want to experiment with some options first? Check your Co-op for new bulk cleaning supplies (coming soon) and new eco-friendly detergents and cleaners from the Nellie’s brand. Their laundry soda, for example, comes in a tin that you can then bring back and refill over and over again from our bulk cleaning supplies area without the need for any more packaging. 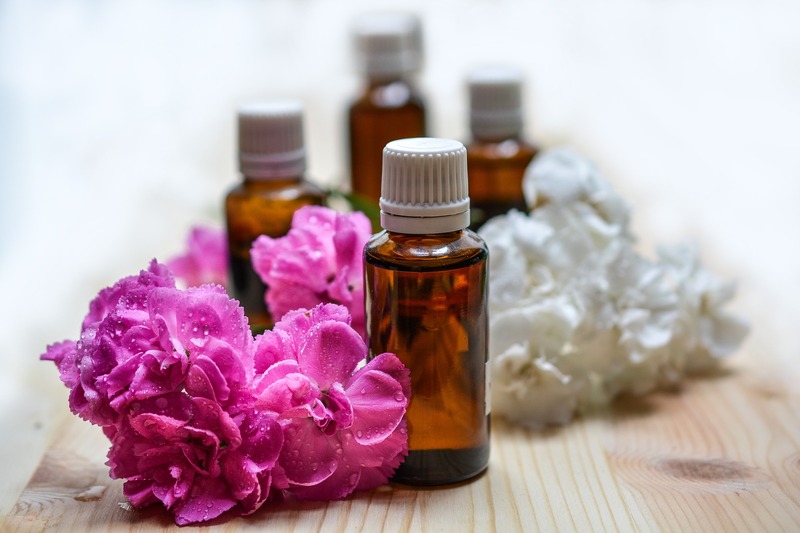 The same goes for our bulk beauty supplies (like rose water) and soap (like Dr. Bronner’s liquid Castile soap) – just bring in your empty container and fill it up! Soap nuts are another versatile and zero waste shopping option that can be used for laundry and creating DIY cleaning concoctions. 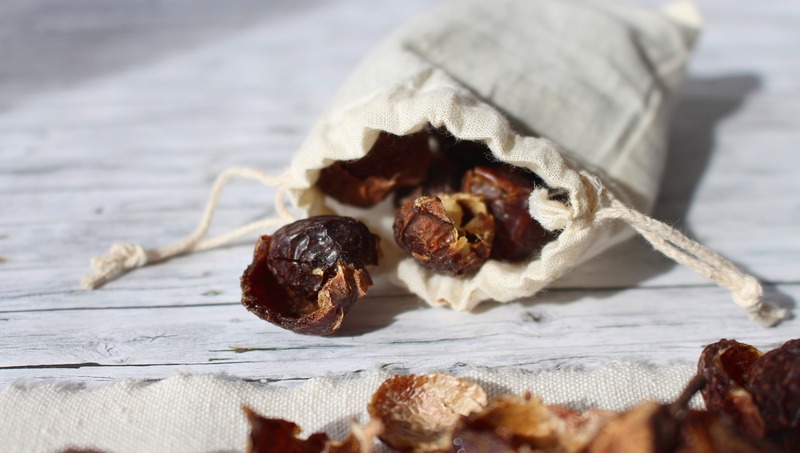 They are all-natural and reusable and despite the name, they’re actually not a nut, they are the fruit of the soapberry tree (who knew?!). Never heard of them? Check out how they work. Mix all ingredients into a spray bottle. Apply 2-3 sprays after showering. Mix and pour slowly over hair. Let sit a minute or two, then rinse. For longer hair, double or triple the amounts. Mix ingredients in a bottle. Use a cleansing pad to apply, then rinse. For a truly no-waste option, spray directly onto face. 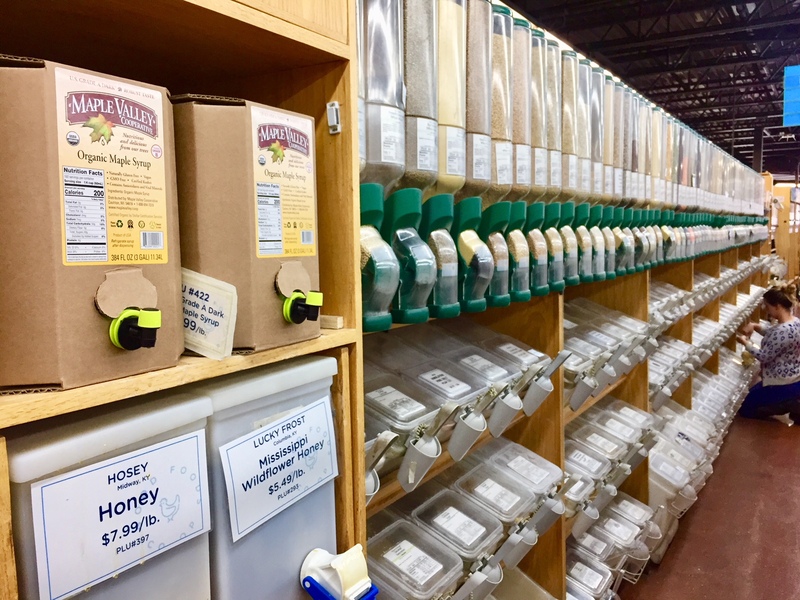 The folks who have been shopping the Co-op for decades can tell you the benefits of shopping for bulk foods when it comes to the cost savings, but the reduction in packaging also makes it zero waste shopping approved. Bring a container from home, get it weighed at our Hospitality Desk or use one of the scales in the bulk aisle to get your “tare weight” (the weight of your container), then fill up using scoops in the bulk bins. I’ve been doing this for years with my flours, sugars, salts and spices, and have recently invested in even more containers to fill up with rice, oats, beans and nuts. I simply write the tare weight in permanent marker on the lid of my container so I don’t have to weigh it again after the first time. So what do you do with your foods once they’re cooked and you need to store them? Obviously, the zero waste answer is to use reusable food storage containers (we have a variety of options at the Co-op). I sometimes run into an issue when I require a plastic sandwich bag, plastic wrap, aluminum foil or parchment paper. For the sandwich bag issue, look into using resealable silicone bags, which can be hand washed and used over and over again. Replace plastic wrap or foil with stretchable silicone lids that fit well over plates, pans and bowls. Need something to line your cookie sheets for non-stick baking? Try silicone baking mats (available with our kitchenwares in Aisle 2). 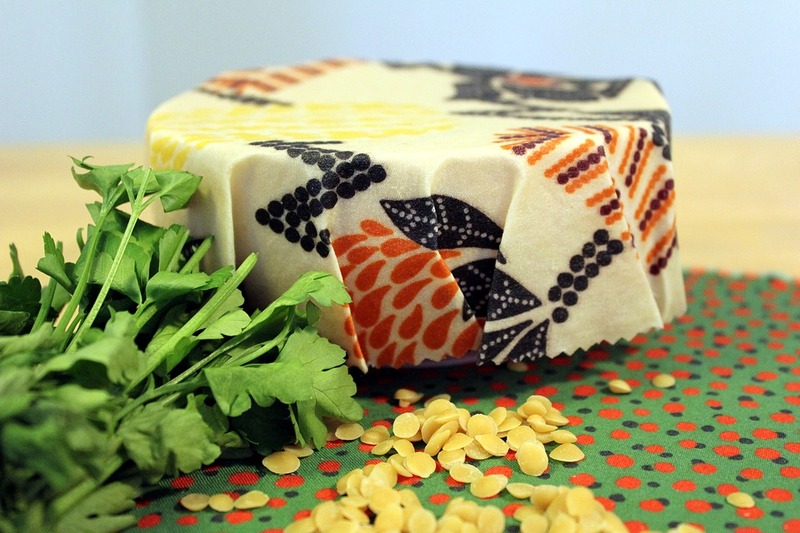 There’s also a DIY, plastic and silicone-free food storage solution – wax food wraps. They’re a great way to repurpose fabrics/clothing and they can be “rewaxed” over and over again after they lose some of their sticking power. This blogger tried many recipe variations before finding the right formula for her food wraps. One uses beeswax (we have solid bars of it available in our Wellness Department, along with the necessary jojoba oil), and there’s also a vegan version using carnauba wax. These zero waste shopping ideas are just the tip of the iceberg! You can learn so much more when you join us in-store on April 20. Starting at 11 am, our super knowledgable staff members, Bambu and Brandy, will give a zero waste shopping presentation followed by a store tour which will start around noon. If those don’t offer you enough inspiration, pop back into the Community Room until 2 pm for a zero waste workshop where you can learn about more recipes and even try some out! Bring your own reusable containers to bring home some samples of DIY zero waste recipes. If zero waste shopping sounds like a great way for you to help the earth, what about zero emissions? Our friends from EVolveKY will be in our parking lot 10 am – 5 pm, also on April 20, for an electric vehicle show and tell. Come out and have fun learning about ways to help reduce your waste!